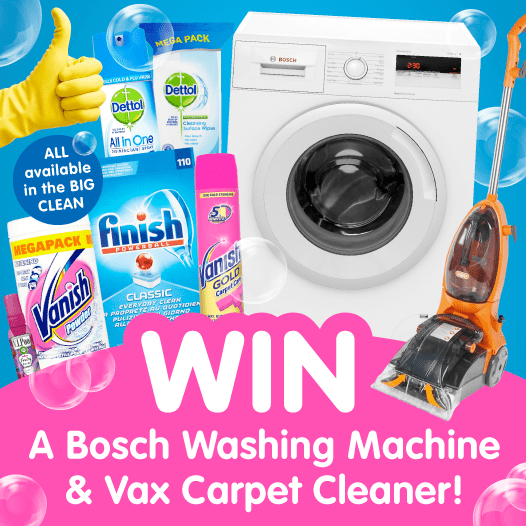 Competitions | B&M Lifestyle | B&M's BIG CLEAN COMPETITION - Chance to WIN a Bosch Washing Machine AND a Vax Carpet Cleaner! B&M's BIG CLEAN COMPETITION - Chance to WIN a Bosch Washing Machine AND a Vax Carpet Cleaner! We've just launched our BIG CLEAN event, so it's a perfect time for a competition! We've decided to give away an amazing prize in our brand new one! We're giving away a chance for ONE lucky winner to WIN a Bosch washing machine AND a Vax carpet cleaner! The winner will be selected at random and you have until 09:00 Friday 8th February 2019 to enter.